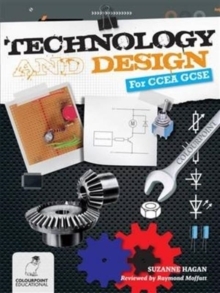 Written for the CCEA GCSE Technology and Design specification. Heavily illustrated with over 500 photographs and diagrams and printed in full colour, the textbook covers all the options for the examined course, following the structure of the specification. It concludes with a section offering tips and advice for the controlled assessment units. The content of the book is supported by past paper questions, activities, word boxes, 'check your learning' and 'key word check' sections. Prior to publication the book was fully reviewed by Raymond Moffatt, who will be well known to many teachers.